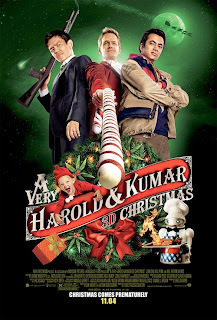 A VERY HAROLD & KUMAR 3D CHRISTMAS is the third film to star John Cho and Kal Penn as the titular comedic stoner duo. Series creators/writers Jon Hurwitz and Hayden Schlossburg are back again as well, and while they aren't quite scraping the bowl for resin just yet, they're definitely getting near the bottom of the bag. Which is not to say their product won't get the job done if you're a fan; the guys deliver a fair number of laughs here, even a few big ones, but nowhere near as many or as big as in the first two movies. If, on the other hand, you haven't thought much of the series prior to this, or you have a general aversion to movies in which most of the humor derives from the characters consuming copious amounts of narcotics (including in this case a toddler), this won't be much of a holiday treat. As the title implies, A VERY HAROLD & KUMAR 3D CHRISTMAS is indeed in 3D, and it actually makes good use of the process. Director Todd Strauss-Schulson isn't ashamed to use 3D as the gimmick it is, and he executes some effective gags with the technique. Not sure if those scenes will play as well when seen flat, so this is a rare case where I'm recommending you fork over the extra couple of bucks for the glasses if you're going to see the movie.